Once upon a time I was on a photo-safari in Kenya. The drivers of each van spoke a different tribal language as their mother tongue. The leader was able to speak to each in their first language. Out of linguistic curiosity, I asked him WHICH language he THOUGHT in. He said it depended on WHAT he was thinking about! Shifting metaphors or shifting languages help provide additional points of view and increase one’s options for dealing with whatever life hands you. In guided imagery and body-centered psychotherapy, metaphors come as visual images, allowing our subconscious to be expressed. In my experience, allowing these images to change and transform can be a path to profound resolution and growth. I don’t know much about wakeful dreaming, though I imagine this would be similar. I find it easy to get tangled up in words and racing thoughts, and listening for these images is deeply meaningful. Looking at your beautifulness in this picture, it’s obvious I would’ve loved you back then just as I do now. Perhaps, that’s what love does: at whatever point we meet in our lives, we love that of life that brought us to that point – the struggles and joys from the whole of life, of lifetimes. Thank you for gracing my life, Michael. Such as what Rumi said (via a rendition by Daniel Ladinsky): “Rumi, Pay Homage” If God said, “Rumi, pay homage to everything that has helped you enter my arms,” there would not be one experience of my life, not one thought, not one feeling, not any act, I would not bow to. P.S. Birthday blessings abounding for thee, Michael. On a very elementary level, just bought the book, The Templeton Twins by Ellis Weiner that teaches metaphors to 9-year olds for my birthday boy, Theo in Seattle. The writing is funny, clever, entertaining, and a beginning of discernment even in a Quaker sense. Happy Birthday, and looking forward to October! Metaphors are the poet’s medium through which his or her message is conveyed. But, in a sense, we are all poets together, finding our way through the significance of things that resonate with what our senses perceive. 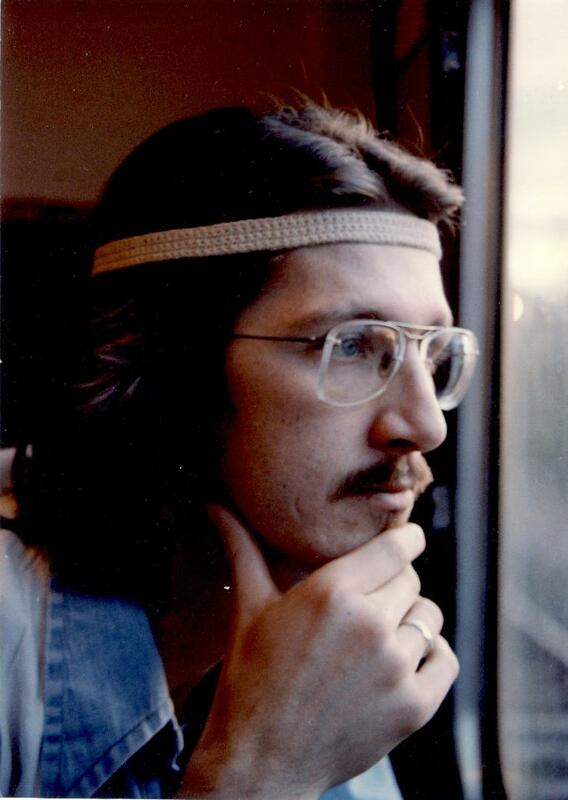 The photo is redolent with hope, with you looking thoughtfully out the window during a moment in your youth when the headband may have been a form of identification with an adventurous lifestyle as well as our first people. So it is fitting that I should wish you the Happiest Birthday ever, since birthdays are markers of that most hopeful day when your life began its never ending venture.